SPRING FLING: BROCCOLI RABE AND GARLIC (A SCRATCH SUPPER) | Jane Lear. Writing on Food and Travel. 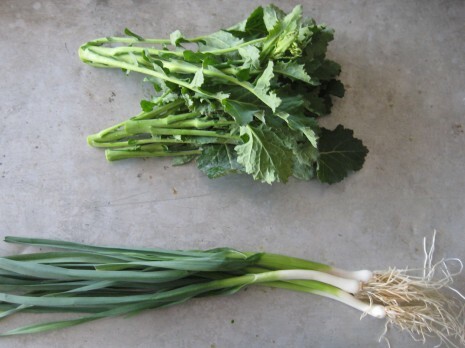 For the past few weeks, we have not been able to get enough of broccoli rabe (pronounced rahb), an assertive green that’s actually closer kin to the turnip than to common broccoli. Descended from the wild mustard that flourishes in Sicily, it was introduced to the United States in 1927, by the immigrant D’Arrigo Brothers under their trademarked Andy Boy label. Broccoli rabe, which is packed with vitamins and minerals, is pretty much available year round. It’s at its peak, though, in the colder months, and so in chilly mid-April, we are unrepentant about our greed. The big, beautiful bunches are guaranteed to catch your eye at the supermarket, where its aliases include “rapini,” “Italian broccoli,” and “broccoli raab.” No matter what it’s called, look for crisp green leaves, succulent stems, and tight buds rather than opened yellow flowers (a sign that it’s too mature and thus too bitter). Lani’s small, immaculate stand (“You could perform surgery there,” remarked my pal Susan) at the Union Square Greenmarket on Mondays and Saturdays* is managed by farmer Steve Yoo, along with his sister Eugina Yoo, who is a curator at heart. The bright signs she pins up over the piles of pristine greens are full of information, including cooking instructions. Among the shoppers that mob the stand, the cards spark the sort of conversational free-for-all more often heard at a cocktail party. I bring home pounds and pounds of this broccoli rabe, and we eat it every night. It is so fresh and tender, I don’t blanch it to tame its bite, the way I do the more pungent supermarket kind. My prep, in fact, takes no time: I simply trim the tiniest bit off the ends, whack the stems and leaves crosswise into thirds (more manageable mouthfuls), and give everything a good rinse. Broccoli rabe has a truly marvelous affinity for garlic. I’ve been pairing it with spring, or green, garlic—that is, very young garlic harvested before the head develops. It looks rather like a scallion, but the leaves are flat, not round. The flavor is mild and very fresh, and consequently you can use lots and lots of it. I generally chop both the white and green parts of the spring garlic and sauté those in olive oil with some red-pepper flakes. Then I add the broccoli rabe and sauté it until it’s simultaneously silky and juicy. This is wonderful served alongside polenta and roast chicken or broiled sausages. It’s also terrific on pasta, with toasted bread crumbs on top. It’s going to appear on my Easter table as well. Sautéed with golden raisins, Kalamata olives, and toasted pine nuts, it will cut the richness of leg of lamb and crunchy roast potatoes. Unless the broccoli rabe is as young and tender as the dawn, cook it, in batches if necessary, in a 6-quart pot of boiling salted water a few minutes, until the stems are crisp-tender. Transfer it to a bowl of cold water, then drain it well. Heat about 1 tablespoon olive oil in your largest skillet over moderately high heat until it just starts to shimmer. Add the garlic and red-pepper flakes and cook, stirring, until the garlic begins to color and is fragrant, about 1 minute. Squeeze any excess water out of the broccoli rabe and add, along with the chicken broth if desired, to the skillet; cook a few minutes, until the broccoli rabe is tender but still juicy. Meanwhile, toast the bread. Put the hot toast in shallow bowls, then top with broccoli rabe and enough cooking liquid to thoroughly sop the toast. Add salt and pepper to taste. Now, this is extremely delicious on its own, but adding one of the two embellishments below takes it to a whole new place. Embellishment #1: Do as my great pal and former colleague Kempy Minifie does with her greens, and gild the lily with a fried egg, sunny side up. Embellishment #2: Cooking authority Roy Finamore learned this trick from his mother. He spreads his toast with Gorgonzola dolce before piling on the broccoli rabe. “The greens have to be really juicy,” he stressed, during a recent confab at the supermarket. We then went our separate ways, only to meet again, minutes later, rooting around among the blues at the cheese counter. The next evening, I realized that, aside from being incredibly delicious, the beauty of this arrangement is that if you are alone you can eat supper with your fingers. * Lani’s Farm is also at the following NYC Greenmarkets: TriBeCa (Saturdays); Carroll Gardens (Sundays); Dag Hammarskjold Plaza (Wednesdays); and Columbia (Thursdays). Posted: April 20th, 2011 under cooking, recipes, scratch supper, spring, Union Square Greenmarket. Great spring vegetable! I had some recently (roasted w/ garlic) and it truly is a wonderful vegetable. Thank you for sharing your recipe, I’ll be sure to try it. broccoli bob! still, i don’t think my three will even taste, but you’d better believe we’ll try. i love it with a few smashed anchovies melted into the olive oil, and a snowy pillow of fresh ricotta between bread and greens. dinner at its spring best. I’m also obsessed with lani’s farm! I agree – it’s impeccably clean there – and the ladies are SO nice. love love love their rabe, and particularly their lacinato kale – which is incredible. and now, early on in the morning, i crave sturdy greens!